There has been some debate lately about the growth of government employment since the beginning of the recession. A recurring argument is that if there was in fact a growth in government hiring during that time, it was only because of temporary hiring for the census in 2010. This chart looks at that question by breaking down historical fluctuations in federal employment–civilians only–since 1990 (federal, because hiring for census workers happens at the federal level). Total federal employment is shown in blue; non-census federal employment is shown in red. During census periods, federal employment fluctuates drastically, increasing during census administration and returning to previous levels at the conclusion of the census. These changes are represented above by blue peaks. Indeed, during the summer of 2010, seasonally adjusted federal employment reached 3.4 million employees, the highest level of federal employment since May 1990. However, at the conclusion of this census, federal employment returned to a higher level than before the census hiring. In fact, at the end of the 2010 census, federal employment was even higher than it had been at the beginning of the recession. 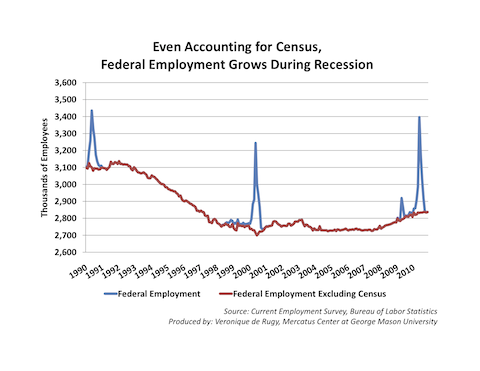 Even controlling for the effects of census employment, federal employment has increased constantly throughout the recession and into today. Since January 2008, net of census hiring, the federal government has grown by 3.5 percent, gaining 98,000 jobs. That means there is much more behind the growth in federal employment than census hiring.